I will assume that most of us have been subjected at one time or another to the freaky Peter Pan guy. He lives in Florida, I live in California and I have seen him in person. He is everywhere, like a virus. He has attended a few events in Los Angeles including the Labyrinth of Jareth Ball and the Renaissance Pleasure Faire. I know, it is a costume and this was taken at a fairy fantasy ball. What’s the big deal? The big deal is he dresses like this all the time. My girlfriend actually stood next to him at that ball and said he smelled like grape soda. That’s just wrong. Men should not smell like grape soda! Little kids at a 4th of July picnic should smell like grape soda. He has been around for a while. His website http://www.pixyland.org has gotten millions of hits. Most are people like me that just click and click and yell “OMYGOD” a lot. First I thought there was no way this guy could be straight. I mean, come on but then I really thought about it and NONE of my gay friends act like this. Hell, no self-respecting Drag Queen would EVER look like this. To quote one of them “Girlfriend is a hot mess and not in a good way. Damn!”. Oh and did I mention he is 57 years old. FIFTY SEVEN?! I’m a little scared right now. The World is just a little off kilter for me. Sure, as long has he doesn’t break any laws, molest any kids (*cough*michaeljackson), knife anyone in their sleep or “sparkle” in the sunlight – whatever. He can do what he wants as long as he doesn’t try to stuff me into really bad fairy wings that don’t look good even on a 12 year old girl from Japan. I don’t know why I should care or why it bothers me so much. Perhaps it is that uncomfortable feeling I get when something is out of place. Sure, I dress up but I am an actor and I am PAID to do that. I don’t go to the grocery store dressed like Alice in Wonderland or Queen Elizabeth or Janet from Rocky Horror. This is the feeling you get when you see a 2 headed calf or a cow that talks to you or something else that is just WAY out of place. You become unseated from your reality and you don’t like the way that feels. While some of us fall down the rabbit hole every once in awhile, I know I don’t want to live there. Have fun in Wonderland/Neverland freaky Peter Pan! I’m going to go back to my boring normal life full of Bill Maher and XBox 360 and Gentleman Jack. Perhaps when I need another shock to my slice of reality, I will give your page another visit. 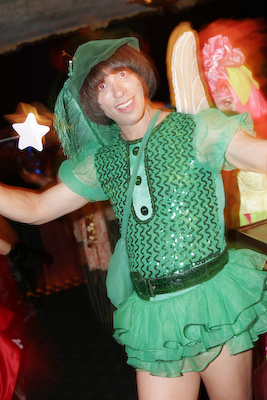 Posted on February 28, 2010, in Uncategorized and tagged real peter pan, scary fairy. Bookmark the permalink. 3 Comments. Hah! I’ve seen pics of this dude and his wedding on a site called “Tacky Weddings.” Do you know who he reminds me of? Stuart from MadTV…the creepy “Look what I can do!” kid. OMG! STUART! That pretty much nails it!